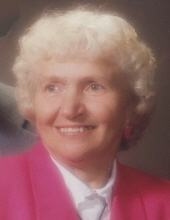 Dorothy Elizabeth Christoffersen, the daughter of Henry F. and Olga (Weller) Beermann, was born August 12, 1925, on her parents’ farm in Crawford County, Iowa and died February 7, 2019, at the Friendship Home in Audubon, Iowa at the age of 93 years, 5 months, and 25 days. On June 23, 1946, she was united in marriage to Lyle “Shorty” Christoffersen at Zion Lutheran Church in Denison, Iowa. They were blessed with four children: Diane, Dale, Neal, and Joni. Dorothy was a homemaker raising her children and helping Shorty on the farm. She cooked and baked not only for her family but also for numerous hired men, corn sorters and detasselers for many years. Dorothy was a member of St. John’s Lutheran Church in Audubon and taught Sunday school for over 25 years. She was also active in the Ladies Guild, where she held many offices. Dorothy and Shorty enjoyed traveling and visited many places in the United States and several other countries. In her more recent years, she enjoyed entering items in the Audubon County Fair. Preceding her in death was her husband Lyle "Shorty" Christoffersen; her son Dale Christoffersen; an infant son; her parents Henry and Olga; infant twin sisters, an infant brother Alvin Beermann, her brothers and sisters Walter and wife Leone Beermann, Edward Beermann, Alma and husband Clarence Denker, Harold and wife Joan Beermann, and Irene Boeck; her brothers-in-law Robert Christoffersen and Mervin Fink. Survivors include her children: Diane and husband Jim Westervelt of Council Bluffs, Iowa, Neal and wife Janet Christoffersen of Audubon, Joni and husband Charles Hansen of Audubon; her daughter-in-law Julie Rasmussen of Exira, Iowa; her grandchildren: Clayton Westervelt of Los Angeles, California, Daniel Westervelt of Fate, Texas, Blaine Westervelt of Council Bluffs, Ann and husband Chad Henrichs of Des Moines, Iowa, Alicea and husband Ben Norton of Omaha, Nebraska, Eric and wife Hannah Christoffersen, Greg and wife Rachel Hansen, and Sara and husband Brad Slater all of Audubon, Iowa Jenny and husband Adam Peterson of Elkhorn, Nebraska, and Heidi Hansen of Omaha, Nebraska; her great grandchildren: Austin, Blake, Chloe, Mila, Eloise, Anna, Drake, Rylan, Colton, Dane, Grace, Ava, Layne, George, Henry, and Ada; her sister Lorena Fink of Loveland, Colorado; her sisters-in-law Carmen Beermann of Denison, Iowa and Mardell Christoffersen of Audubon, Iowa; her brother-in-law Gaylord Boeck of Schleswig, Iowa; nieces, nephews, other relatives and friends. The family will be meeting with friends Thursday evening, February 14, 2019 from 4:00 P.M. until 7:00 P.M. at the Kessler Funeral Home in Audubon, Iowa. Funeral services will be conducted by Pastor Gordon Buchholz on Friday, February 15, at 10:30 A.M. at St. John’s Lutheran Church in Audubon, Iowa. Interment will be in the Maple Grove Cemetery in Audubon. The casket bearers will be Clayton Westervelt, Daniel Westervelt, Greg Hansen, Blaine Westervelt, Eric Christoffersen, and Dale Wegner. To plant a tree in memory of Dorothy Elizabeth Christoffersen, please visit our Tribute Store. "Email Address" would like to share the life celebration of Dorothy Elizabeth Christoffersen. Click on the "link" to go to share a favorite memory or leave a condolence message for the family.